This website honored him in the summer of 2004 shortly before his death. Artwork, writings and links to his past are featured. This is the obituary that appeared in the NY Times shortly after his death on September 10, 2004. In March of 2003 as Anthony Toney approached his 90th birthday, he and his daughter, Anita had a joint retrospective at the College of Marin and this article appeared in the college newspaper. In honor of his 90th birthday retrospective, a note appeared in the Alumni news and also makes reference to his donation of 20 paintings several years earlier. This book by Richard Bermark includes photos of Anthony Toney, a veteran of the Abraham Lincoln Brigade. He fought in this international brigade in Spain against the fascist forces led by Franco in the mid 1930's. This gives the location and description of several murals that Anthony Toney did under the auspices of the WPA project during the 1930's in Gloversville , New York (Fulton County). His daughter Anita spoke with a reporter about his participation in the Spanish Civil War while attending the dedication of the first national monument to the Veterans of the Abraham Lincoln Bridgade which was unveiled in the embarcadero of San Francisco that day. His death was noted in Art in America in the January issue of 2005. 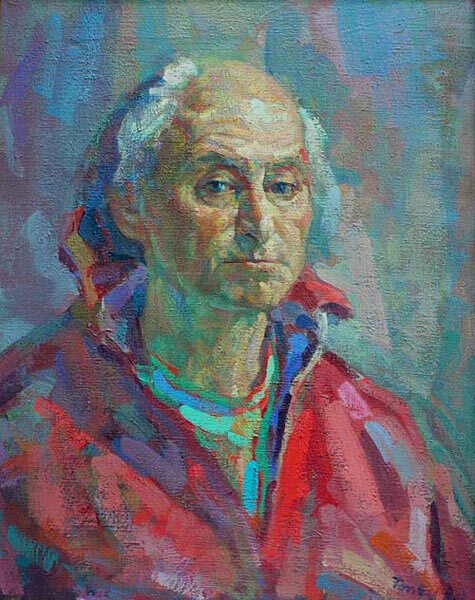 In 1994, Anthony Toney donated 20 paintings to Teacher's College, Columbia University where he had received a Doctorate of Art Education in 1955. Anthony Toney is mentioned with other artists of his time as they struggled with integrating politics and art. In its description of the New School for General Studies in New York City, Wikipedia cites Anthony Toney among its prominent faculty. He taught painting and drawing there for over 40 years. One of several books about art and politics that mention Anthony Toney and his work. This article refers to an exhibit of three friends and artists in 1994. Anthony Toney was included in a list of exceptional people who died in 2004 by the San Francisco Chronicle. San Francsico Chronicle's obituary focuses on the many achievements of his life. Anthony Toney's wife, Edna died in 1993 and was a dedicated writer, playwright, actress and activist. Following in her father's footsteps, Anita has made her career in art. Her medium, however, is multiple plate color etchings. ©2017 The Art of Anthony Toney. All rights reserved.